Four looks for the Four-Keyhole Steeked Mesmer Veil scarf. This afternoon I added four small steeks (cut holes) in a wide Tunisian lace scarf. I’ve had this scarf for years. It’s an old oversized swatch, really. It gave rise to the Mesmer Tunisian Veils pattern and to the Maze Vest in the summer 2014 issue of Interweave Crochet Magazine. 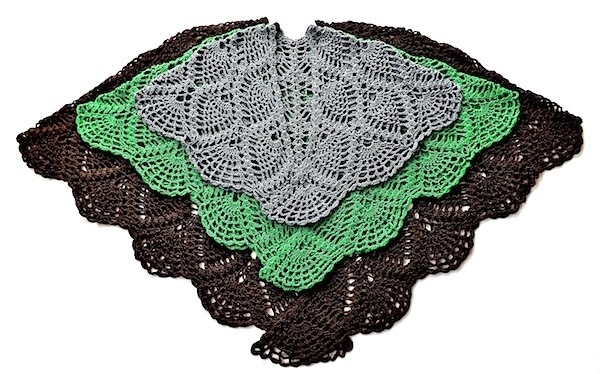 One of my goals has been to create a “keyhole” (steeked) crochet scarf for my July Steeking Tunisian class. A keyhole scarf is just one of many reasons to steek. Not only does adding a “keyhole” (a steeked slit) make it easy to wear now, it can be styled so many ways. This is Day 18 out of the 50 conference prep days I have until the big event. I can cross this project off my list! I’ve been wanting to turn my pink Mesmer into a steeked crochet scarf for months. Today is also the day that Tropical Storm Colin arrived, and I’m happy to report that it has gone easy on us (so far). The worst seems to be behind us and it has been no big deal. My son did have to miss school today—we couldn’t get to the mainland. The flooding is minor compared to what it could be, and the wind and rain have been milder than predicted. No power outages so far; no need to move the car to higher land. At least one of these photos was taken by Doris Chan at the Chain Link Conference fashion show, 2010, Manchester New Hampshire. View full size. Found these photos I’d forgotten about! They was taken at a crochet conference in 2010. I’m modeling the Tunisian Weightless Wrap because it won an award in the CGOA Design Contest. I think 2010 was the very first year of the contest. It has since become an exciting annual event, thanks to Doris Chan’s tireless efforts in the first 3-4 years of it. The Weightless Wrap is the inspiration for one of my longest running crochet classes on Tunisian eyelet meshes. I’ve just completed the 2016 class resource page for it–that’s how I found these photos again.